Readers overwhelmed by the world's complexities will find solace in Ullman's endearing first novel featuring woodland creatures quite content to live an unfettered existence. Shortly after moving to the country with her recently divorced mother, Willa, a fourth grader who sorely misses her father and is overcome by worries, begins having fleeting visions of doll-size beings and their miniature abodes. The sightings last only a few seconds, leaving Willa to wonder whether or not what she has seen was real. Eventually, she connects her visions to wondrous tales about the ""Nutfolk"" told to her by her new neighbor, an ancient woman named Hazel, who lives as simply as the woodland creatures she describes in her stories. 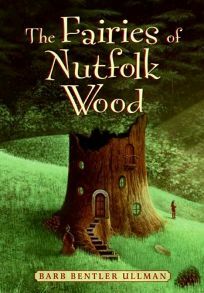 According to Hazel, the Nutfolk, a friendly, peaceful community of fairies, have special powers to heal and also to protect their surroundings. Searching for evidence that the Nutfolk exist distracts Willa from her woes and helps solidify new friendships with Hazel and Hazel's young helper, Vincent. Although some aspects of the plot appear forced (as in Willa's discovery of hidden sketches of the Nutfolk), the novel's invitation to ""look behind Nature's magic"" is inspiring. Readers, no doubt, will suspend their disbelief about the magical fairies much sooner than Willa, and may yearn for more episodes about the Nutfolk. Ages 8-12.